The British Royal Navy successfully spotted and reported the illicit activity to the United Nations. On April 5, the United Kingdom’s Royal Navy announced that it had successfully reported on an instance of North Korean illicit ship-to-ship transfers at sea to the United Nations as part of its sanctions enforcement efforts in the Indo-Pacific region. In collaboration with the Japanese Maritime Self-Defense Force, HMS Montrose, a Duke-class Royal Navy frigate, detected what the British government said was a “ship of unknown nationality” near a North Korean vessel carrying out a ship-to-ship transfer. The North Korean vessel involved was a tanker named Saebyol, which, according to the British government, was “conducting a prohibited ship-to-ship transfer.” The incident took place on March 2. “Our Royal Navy presence in East Asia over the last year has been a robust deterrent against those trying to evade international sanctions on North Korea. Sanctions evasion helps facilitate North Korea’s nuclear weapons program and is a major source of funding,” British Defense Secretary Gavin Williamson said in a statement. “Sanctions will remain in place. The Royal Navy will keep enforcing them until we see concrete steps towards North Korea’s complete, verifiable and irreversible denuclearization,” he added. Japan, which was involved in the Royal Navy’s ship-to-ship sanctions enforcement operation, has long participated in efforts to enforce international sanctions and monitor possible illicit ship-to-ship transfers at sea being conducted by North Korea. Last year, the Japanese Maritime Self-Defense Force (MSDF) publicized at least two instances where it detected such activity. In May 2018, an MSDF surveillance aircraft saw a ship bearing a Chinese flag transferring fuel to a North Korean tanker in international waters. 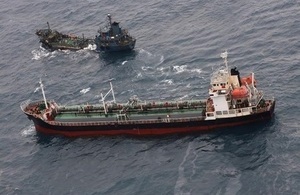 This image, released by the Japanese Ministry of Foreign Affairs, shows a Dominican-flagged Yuk Tung oil tanker near the North Korean-registered Rye Song. The image was taken after an alleged illicit ship-to-ship transfer of fuel in the South China Sea. In December 2018, the Japanese Ministry of Foreign Affairs released photos of two vessels taken in the South China Sea, showing a Dominican-flagged vessel near a North Korea ship, allegedly after an illicit ship-to-ship transfer of fuel. Both Japan and the United Kingdom are part of the Group of Seven, whose foreign ministers on April 6 released a statement underscoring their commitment to the international sanctions regime on North Korea. “We further commit to countering the DPRK’s sanctions-evasion tactics, particularly through its illicit maritime activities, including prohibited ship-to-ship transfers of petroleum and sales of coal and other UN-banned commodities, as well as its malicious cyber activities,” the communiqué agreed by the G7 foreign ministers in Saint Malo, France, noted. North Korea has sought to have sanctions against it relaxed. At the Hanoi summit at the end of February, North Korean leader Kim Jong Un asked U.S. President Donald J. Trump to relax the clauses pertaining to the country’s civilian economy across five major United Nations Security Council resolutions passed between 2016 and 2017 to be fully relaxed in exchange for the dismantlement of some nuclear-related facilities in the country. The summit ended without agreement as the United States refused to relax sanctions before North Korea agreed to completely disarm itself of nuclear weapons. In March 2019, the United Nations Panel of Experts on North Korth emphasized Pyongyang’s continued use of ship-to-ship transfers in violation of United Nations Security Council resolution 2397, which quantitatively capped crude oil and petroleum imports to North Korea. The report said North Korean activities rendered those sanctions largely ineffective. “These violations render the latest United Nations sanctions ineffective by flouting the caps on the DPRK’s import of petroleum products and crude oil,” the report noted. “These transfers have increased in scope, scale, and sophistication with more than 50 vessels and 160 associated companies under investigation,” the panel added. Fraudulent ship registration makes the already challenge task of sanctions enforcement more difficult.